We want to share our passion for barbecue with you—and hope you take the skills and recipes we share, to help you incorporate barbecuing and grilling into your everyday life. Learning to barbecue healthy and incorporate it into our weekly & often daily meals has helped all of us to lose significant weight, have more energy & get to spend quality time with friends & family while enjoying the outdoors. Cooking doesn’t get any better than that! Michelle M: That’s me. This blog is my brainchild as I wanted to create a collection of all the great recipes and barbecue techniques my Dad has shared with me and taught me while growing up. What I realized while doing so is that we should share with everyone and create a blog out of it, not just a personal cookbook for my family. I grew up cooking on a barbecue with my father Jim and those are some of my most cherished moments with him. I had no interest in learning to cook meals with my parents in the kitchen—but if they enticed me with a barbecue I would hang out with my family the whole time and learn about barbecue. This led to a passion for barbecue that I still embrace today and incorporates into practically every dinner. This blog is a collaboration of recipes from Jim & Sal, some that I have designed on my own (thanks to my parents teaching me to always ‘get creative’ in the kitchen) and I will also be incorporating the “Paleo Barbecue Recipe Corner”. Whenever I can eat Paleo I feel tremendously more healthy and have fun coming up with new and innovative Paleo recipes for the grill everyday. It is only natural that over time his childhood fascination turned into a passion for all things BBQ. 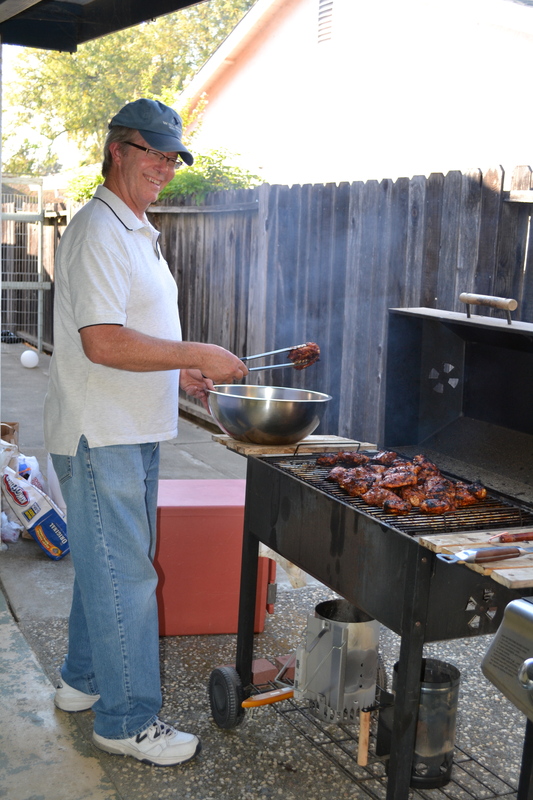 Although Jim will use charcoal and/or wood BBQ most of the time, he also appreciates the ease and timeliness of a good gas grill. And most of our recipes will work on either one. A passion for cooking has always been a part of his life—from helping his French-Italian mother prepare her famous lasagna to putting up preserves with his Grandma—his fascination with cooking has been around as long as he can remember. Jim majored in Hotel and Restaurant Management in college and then opened up his first restaurant together with his brother in 1979 and has been involved with running restaurants ever since. 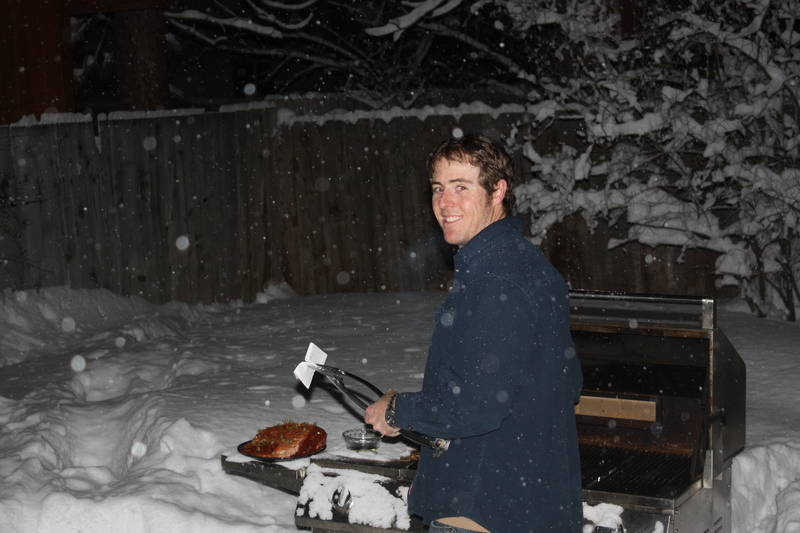 However where he has always enjoyed cooking the most is out on the barbecue. 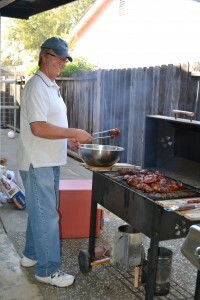 Jim has long been the BBQ Guru for catering events, family barbecues and cookouts with friends. Now in semi-retirement, Jim wants to share his love and knowledge with anyone who will listen. If you ask him a “How to” question you better be prepared for a very detailed & passionate answer! Sally, Jim’s wife, went to college at UC Santa Barbara where between studying and beachcombing, she worked for the University catering and as a fill-in cook for her sorority. She ended up changing her major to Hotel and Restaurant Management and has been working in restaurants, delis and as a caterer ever since. One of her career highlights happened when she was working as a pastry chef in Santa Barbara and was summoned to a table by four individuals who were enjoying her desserts. And who was it that asked to meet the pastry chef? None other than the fabulous Julia Childs herself along with her husband Paul and another couple. What better compliment could there be? Before getting together with Jim though, she rarely ate meat, did not care for any type of BBQ sauce and couldn’t stand anything with bones. My, how times have changed! It did not take long for Jim to convert Sally over 20 years ago and she’s never gone back. 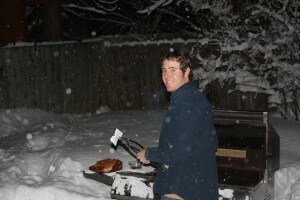 Alex M: Alex grew up barbecuing in Hawaii with his Dad & now barbecues in Tahoe surrounded by 4 ft snow banks sometimes barbecuing in a snowstorm. Needless to say no matter where he is barbecue has been a part of his life & he has been a great contributor to this project. From teaching us film novices how to even use a tripod to bringing some really good barbecuing skills to the table—we love having him be a part of this healthy barbecue project with us!